Thirty years after a global effort to protect the ozone layer began, scientists have revealed that man’s efforts, combined with favourable climatic conditions, have shrunk it to its smallest area since 1988. In the 1970s, researchers established that chemicals used in fridges and aerosol cans, known as chlorofluorocarbons were eating away at the ozone layer above the Antarctic. Concerns that this was allowing carcinogenic radiation from space to penetrate more easily to the earth’s surface prompted a world-wide effort to reduce the chemical’s use, codified in the Montreal Protocol of 1987. Chlorofluorocarbons can remain in the atmosphere for many years but the reduction in their use does seem to be having an impact. 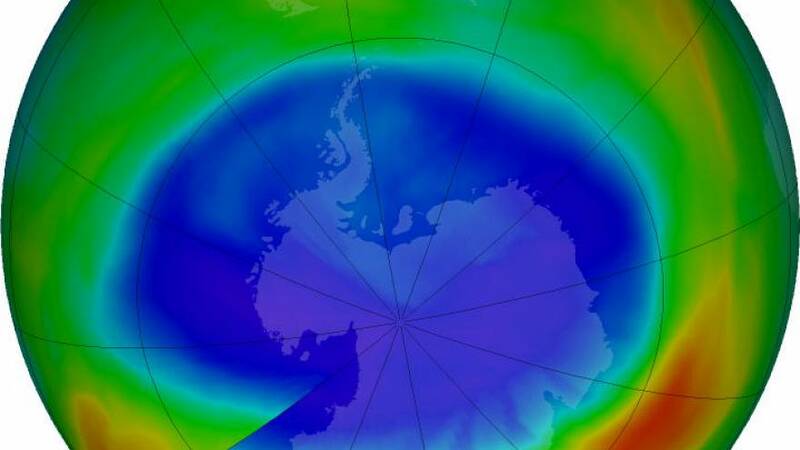 In 2000, the hole in the ozone layer spread over an area of around 30 million square kilometres. Now, thanks in part to warmer conditions in the upper atmosphere it has dropped below 20 million square kilometres, according to Nasa . That’s about 2.5 times the size of the USA. Nasa describes ozone, formed from Oxygen atoms, as like a sunscreen protecting the earth, although it can have a harmful impact if present in the air that we breathe.